Ravi Chandra Singh and his colleagues at the Golden Sentinels Investigations never have a dull day. The novel opens with impact detailing an undercover operation, complete with colleagues playing bodyguards as they con a conman. While all members of the Golden Sentinels team have their own skills, Ravi stands out through his consistent visions of gods, accepted, even welcomed by his associates. It is something he tolerates rather than welcomes, uncomfortable with fear of mental illness and trepidation as to the meaning of the gods’ behaviour. Deception seems a stock in trade of Golden Sentinels, as they go on to another case where undercover skills are employed. When the first wife and son of a recently dead Russian go missing, the team are employed to find them for the willreading. As they investigate, they notice a disturbing pattern in the family history of the man’s aristocratic English second wife and find the job comes with a high price, despite their healthy fee. Ravi is a man with a conscience, a burden not felt by all his associates. He is unable to shrug off the violence he encounters as part of the job. The constant presence of the gods, laughing, dancing, even texting, gives him more unease as he wonders what they see ahead. 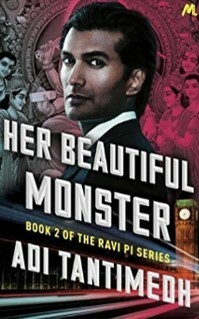 When sent away with colleague and girlfriend Julia to observe the Los Angeles office and clear his head, Ravi encounters more violence and questions his career choice. Nevertheless, he is fully professional and conscientious when expected routine tidying up leaves Julia and him dealing with a major and terrifying issue, “above his pay grade”. Even absent colleagues reached on the telephone advise him to walk away. Tantimedh gives us an insight into Ravi’s life as a PI and his thoughts and feelings about the impact of his role. We see his involvement in several cases and the common themes of each, rather than a longer plot focusing on one crime. It is a different approach, interesting, with a likeable character, who, despite his doubts, looks set to continue.